modify it to your custom web calculator. 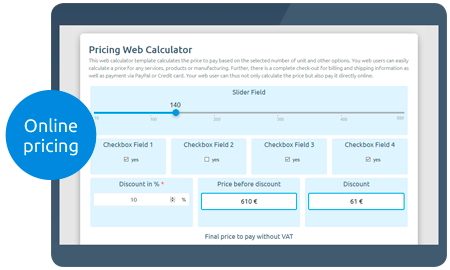 This web calculator template calculates the price to pay based on the selected number of unit and other options. You web users can easily calculate a price for any services, products or manufacturing. Further, there is a complete check-out for billing and shipping information as well as payment via PayPal or Credit card. Your web user can thus not only calculate the price but also pay it directly online. 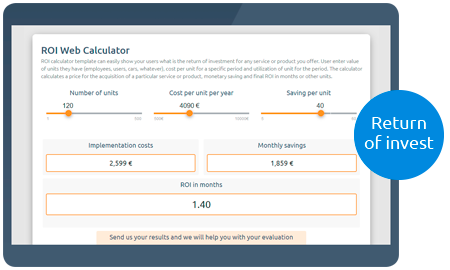 ROI calculator template can easily show your users what is the return of investment for any service or product you offer. User enter value of units they have (employees, users, cars, whatever), cost per unit for a specific period and utilization of unit for the period. The calculator calculates a price for the acquisition of a particular service or product, monetary saving and final ROI in months or other units. 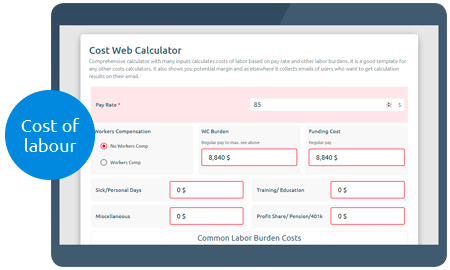 Comprehensive calculator with many inputs calculates costs of labor based on pay rate and other labor burdens. It is a good template for any other costs calculators. It also shows you potential margin and as elsewhere it collects emails of users who want to get calculation results on their email. 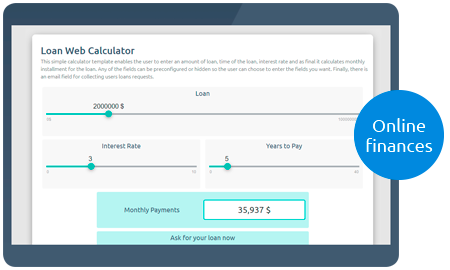 This simple calculator template enables the user to enter an amount of loan, time of the loan, interest rate and as final it calculates monthly installment for the loan. Any of the fields can be preconfigured or hidden so the user can choose to enter the fields you want. Finally, there is an email field for collecting users loans requests. 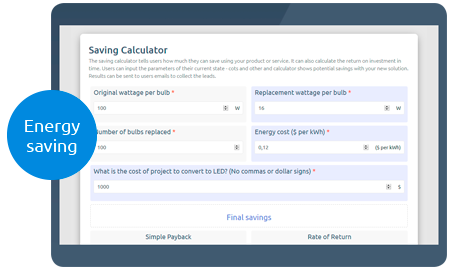 The saving calculator tells users how much they can save using your product or service. It can also calculate the return on investment in time. 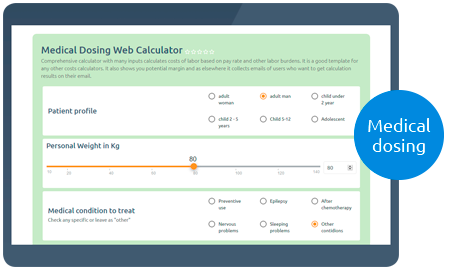 Users can input the parameters of their current state - cots and other and calculator shows potential savings with your new solution. Results can be sent to users emails to collect the leads. 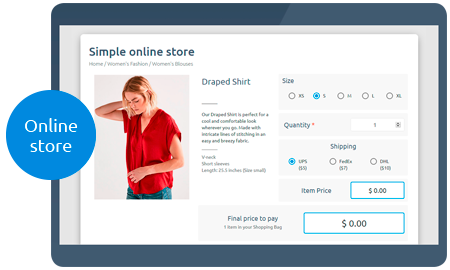 Create a simple online store with product image, description and other options. Enter quantity of product, calculate the final price and choose shipping. Finally fill complete checkout and get paid online.